To prepare for an oil change on my neighbor’s 2004 Yamaha V-Star 650 cruiser, I gathered up my tools, laid down some cardboard to catch spills and drips, prepped my recycling containers, and readied the fresh oil and filter. She rode the bike enough to warm it up, then rode it over to my place, so the oil would be nice and warm, and flow out easily when drained. 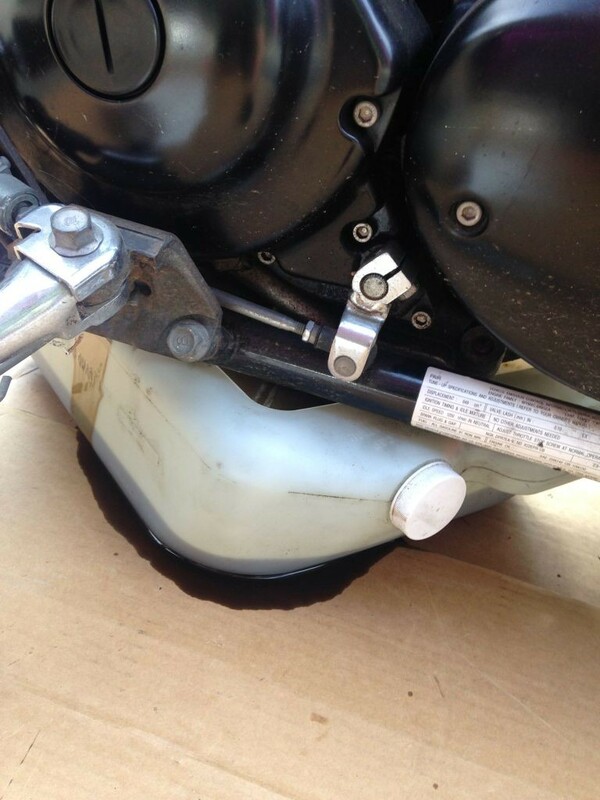 * 3-4 quarts of 20w50 viscosity motor oil (my neighbor chose Castrol motorcycle-specific synthetic oil). 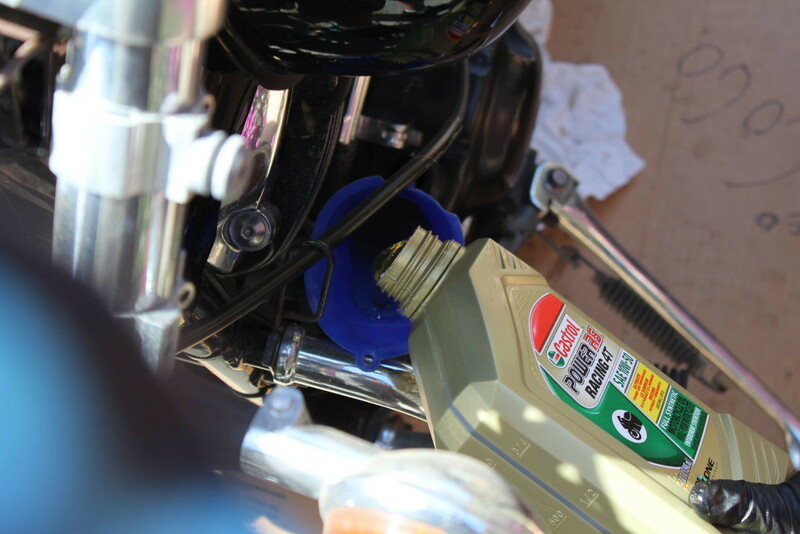 If you choose regular car oil rather than motorcycle oil, the round label on the back should NOT read “energy conserving”. If it does, your clutch may slip from the extra-slippery additives in the oil, intended for use in cars and trucks. Yamaha has been making the V-Star 650 motorcycle, with only cosmetic changes, from 1998 to the present. The oil and filter change procedure for all these bikes is substantially similar for all of ’em. 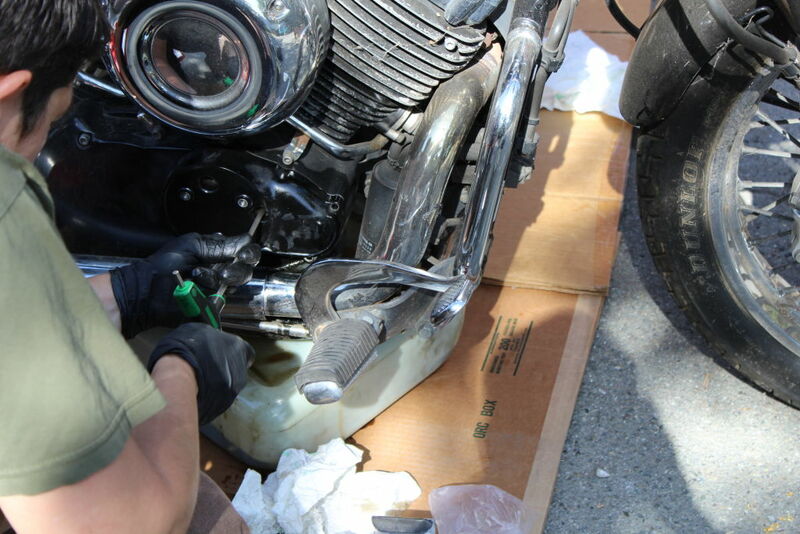 To get the oil pan under this low-slung cruiser, we propped the kickstand up on a brick, giving a little extra room to push the pan beneath the engine. 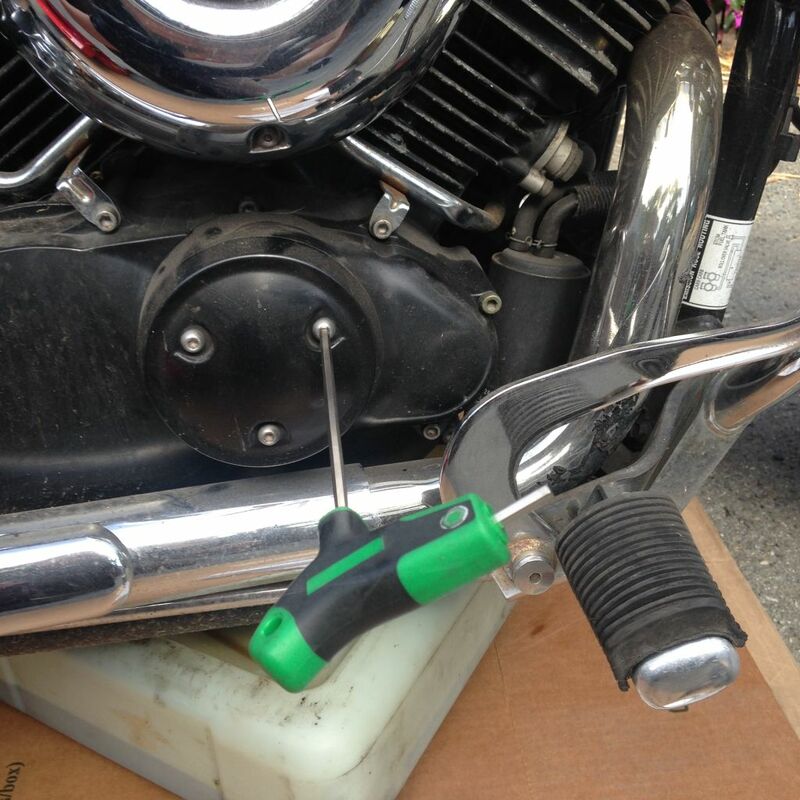 After pushing the pan beneath the bike, I got down on the ground on the left side to locate the oil drain bolt. 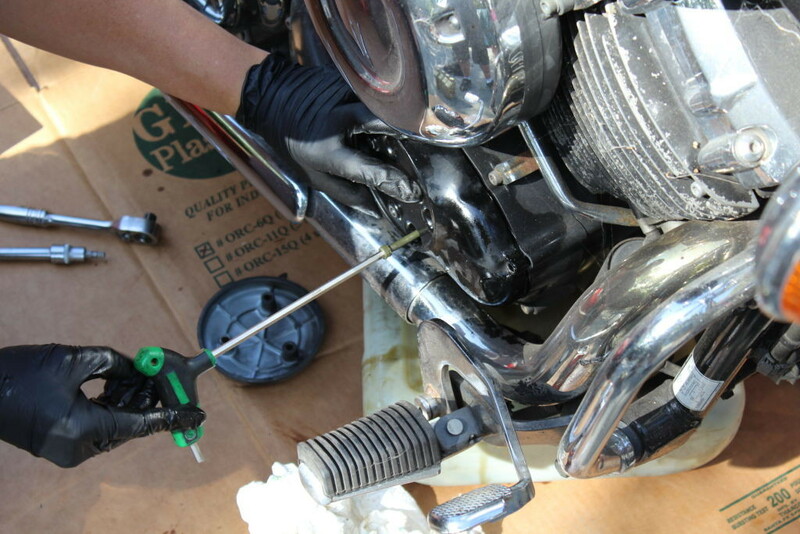 The oil drain bolt is on the rider’s left side of the bike, tucked beneath the frame rail, on the lower left side of the oil pan. I wiggled my 17mm socket onto the bolt and wrenched it loose. 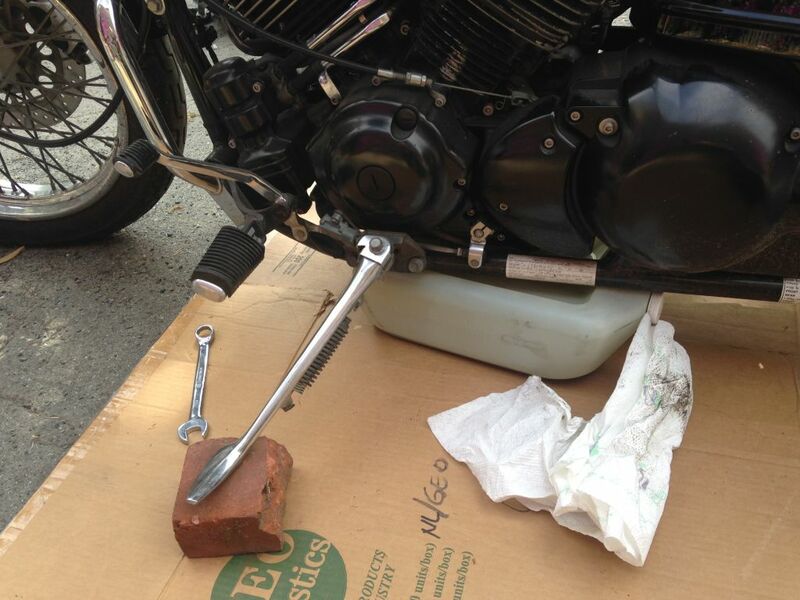 The oil drain bolt is reached on the left side of the bike, beneath the frame rail, on the left side of the oil pan. 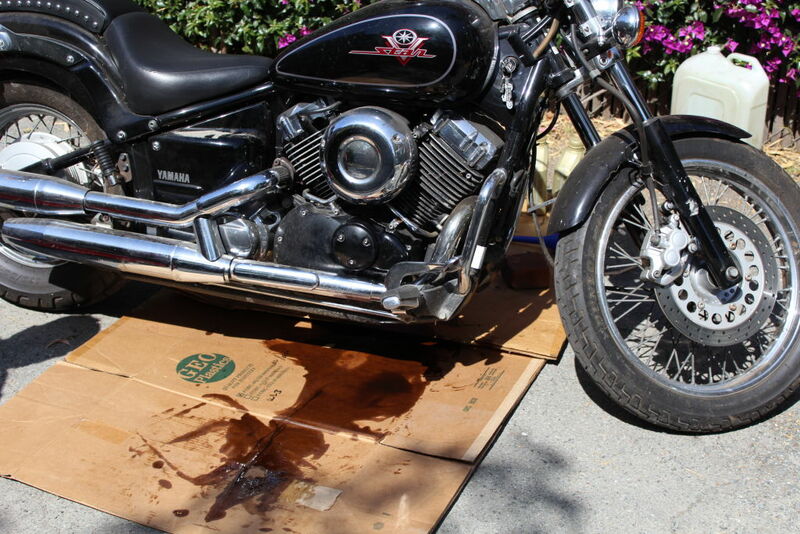 The oil poured out, a small amount of it missing the pan and making a bit of a mess–on the cardboard, fortunately. Oil-contaminated runoff is toxic, so better on cardboard than on your driveway. 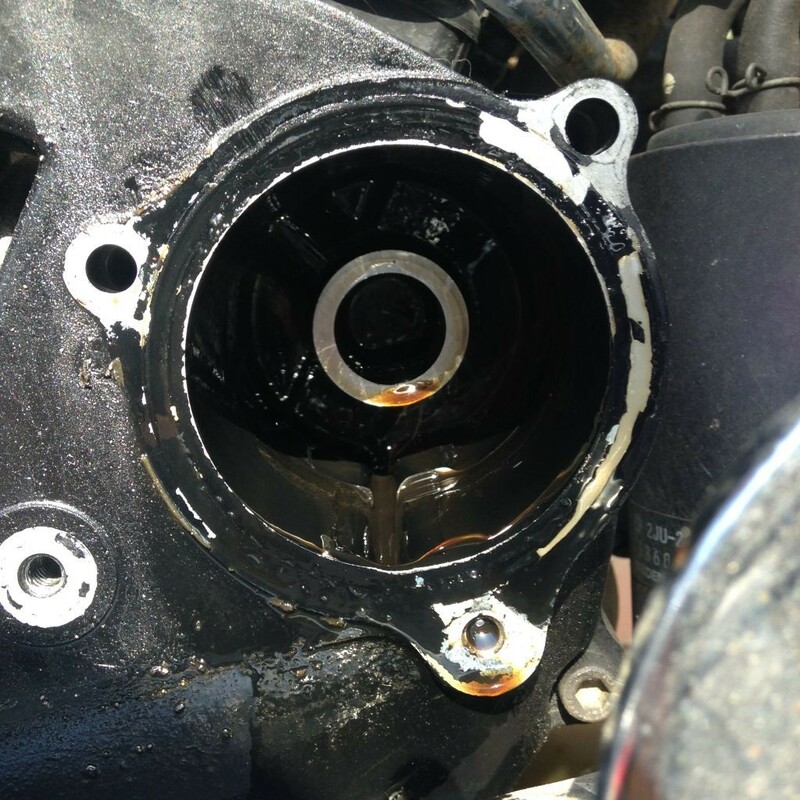 Oil draining–most of it into the oil pan! I added a new crush washer to the oil drain bolt and set it aside. While the engine oil continued to drain, I moved to the filter. 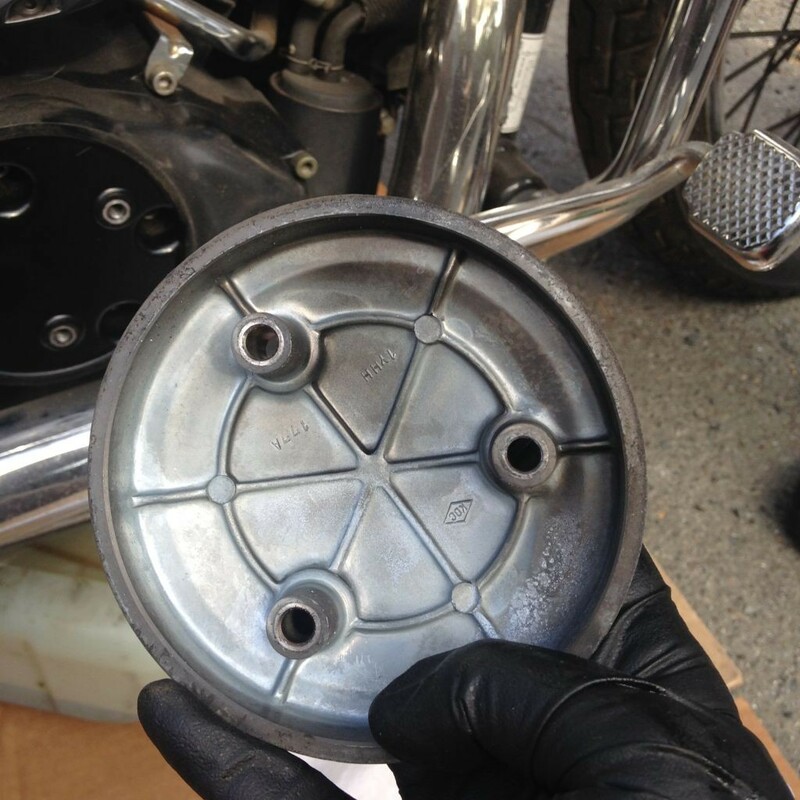 The V-Star 650 has a 2-part decorative cover over the oil filter housing, and both pieces need to be removed separately to access the filter. Using my allen wrench, I pulled the 3 bolts from the outer cover and removed it. 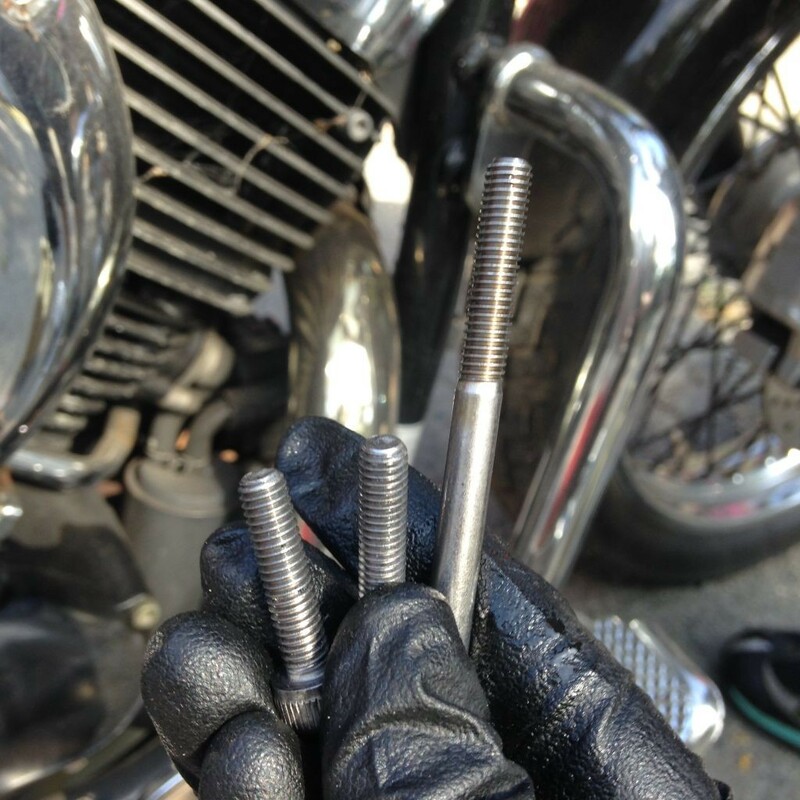 Allen (also known as hex head) bolts can strip out and cause more trouble than anyone needs, so I used high-quality allen wrenches or socket bits, and used a careful hand to make sure the bolts came out smoothly. I carefully kept the 3 allen bolts with the outer cover, then began to undo the allen bolts of the inner cover. 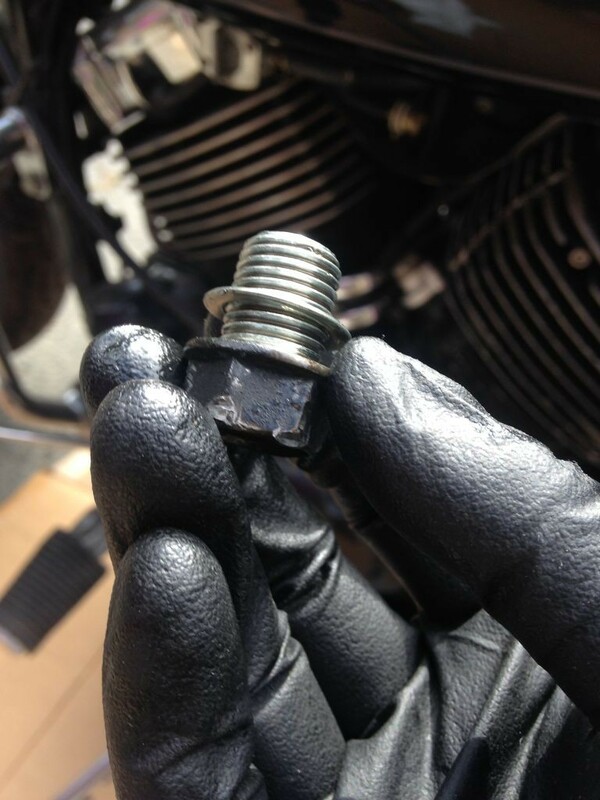 The bolts holding the inner oil filter cover are different lengths, and each must return to its proper place. Laying them out in a place they won’t be disturbed, in order, is a good idea; poking them through holes in cardboard in a way that matches the orientation of the inner cover is a good way to do it as well. One of the allen bolts holding the inner oil filter cover is tough to get to–the rear brake pedal prevents access to its head. 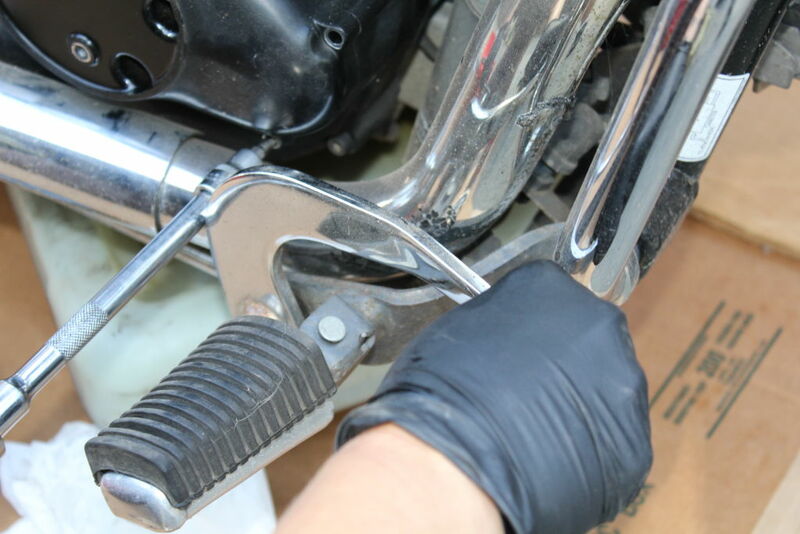 Try different types of allen wrenches and sockets, and most importantly, press the rear brake down with one hand while putting the tool on the bolt with the other. 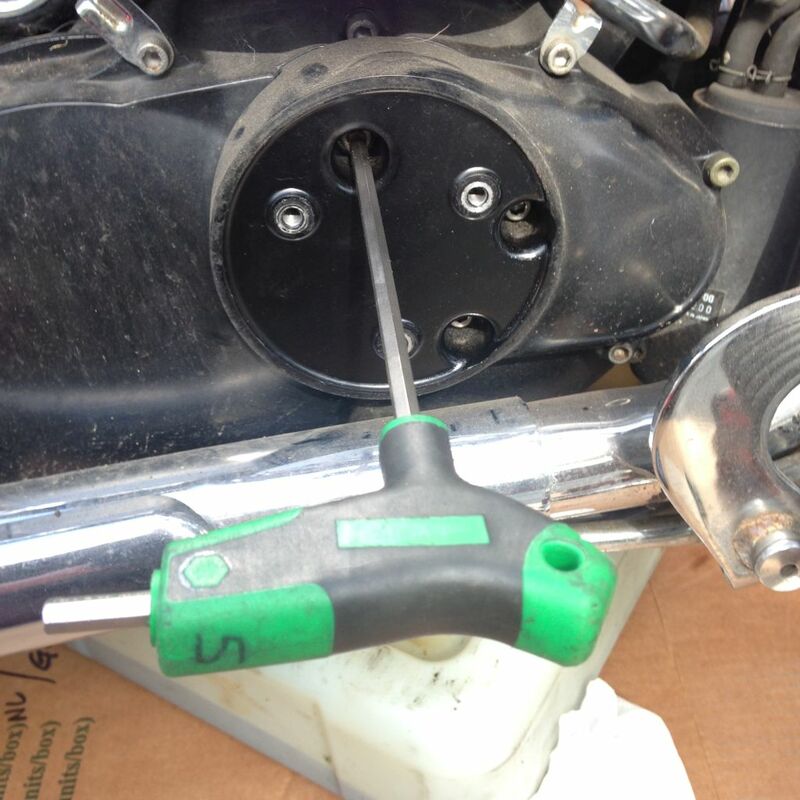 Again, be careful not to strip out the allen bolt–it’s easy because of the awkward access. 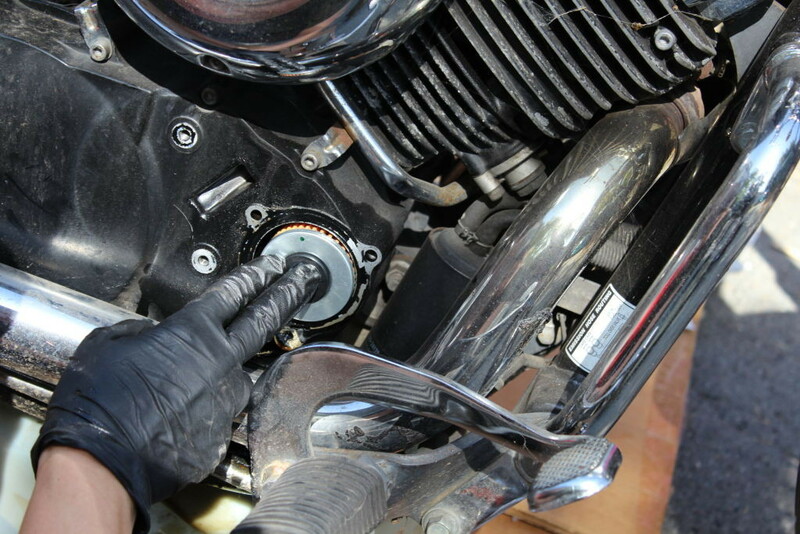 The inner cover should be carefully handled when you remove it, too, so you don’t harm its gasket. If it does get damaged, it must be replaced or it will leak. At last, I arranged all the different-length bolts in order, removed the oil filter cover, and pulled out the oil, used oil filter. Success! The old oil filter, accessible after removing the filter cover. With the filter removed, I checked the empty oil filter housing for debris, sludge, or other problems, wiping it out with a rag. I placed the oil filter on its spike in my oil filter drainer. They can also be simply drained out over your oil pan, or on a spike or rack in the pan. Whatever method you use, the filter should drain at least overnight before you bag it in a ziploc bag and recycle it alongside your oil. Now, it was time to install the new oil filter. I checked all the o-rings and made sure I was inserting the new filter in the correct direction. Carefully, I held the inner oil filter cover in place, and installed the varying-length bolts around its perimeter in the proper order. 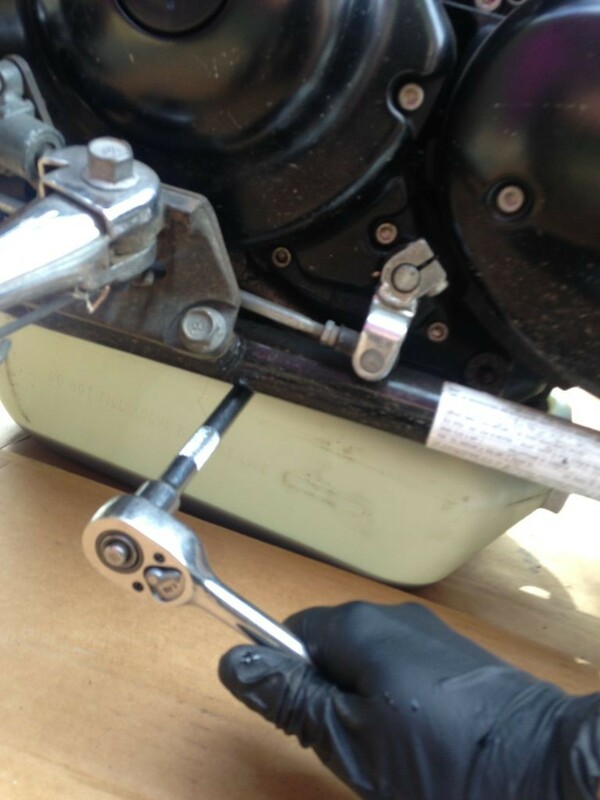 I torqued each bolt down gently but securely (the spec in the manual is 10Nm, or 7 ft-lb., so not much), not wanting any to strip or snap, and accessed the head of the last bolt by pressing down the rear brake pedal, as before. I also tightened the bolts in a diagonal or star pattern, so that the aluminum cover would not warp from uneven pressure. Once the inner filter cover was secure, I replaced the outer filter cover. 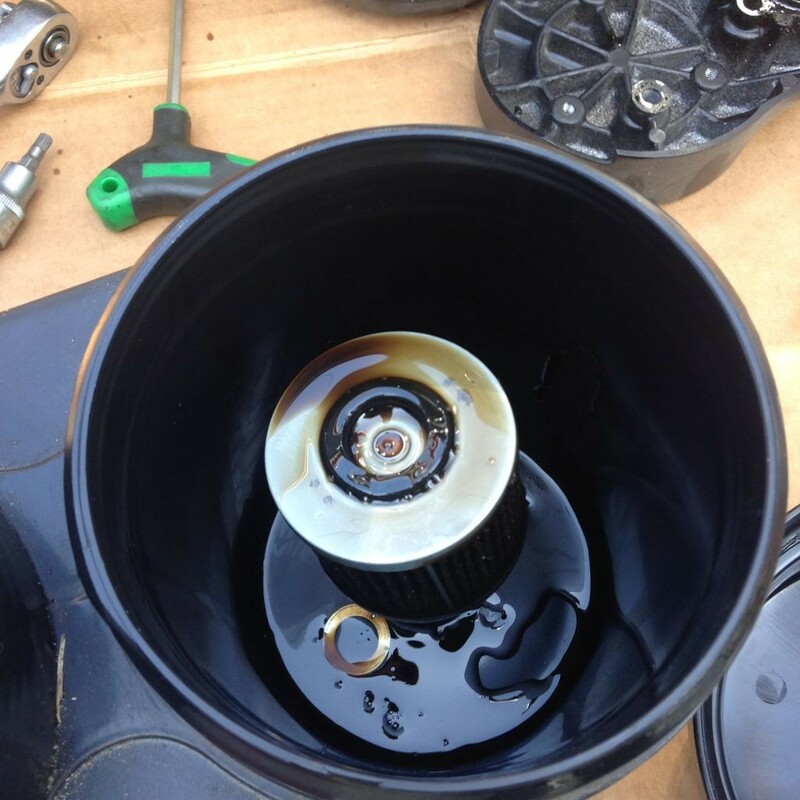 With the new filter in place, I slid out the used oil pan and replaced the cap, setting it aside to recycle. Making sure that the new crush washer was on the oil drain bolt, I re-inserted it and torqued it down firmly–but not harshly. You want to gently smush the crush washer without damaging the aluminum threads or case. 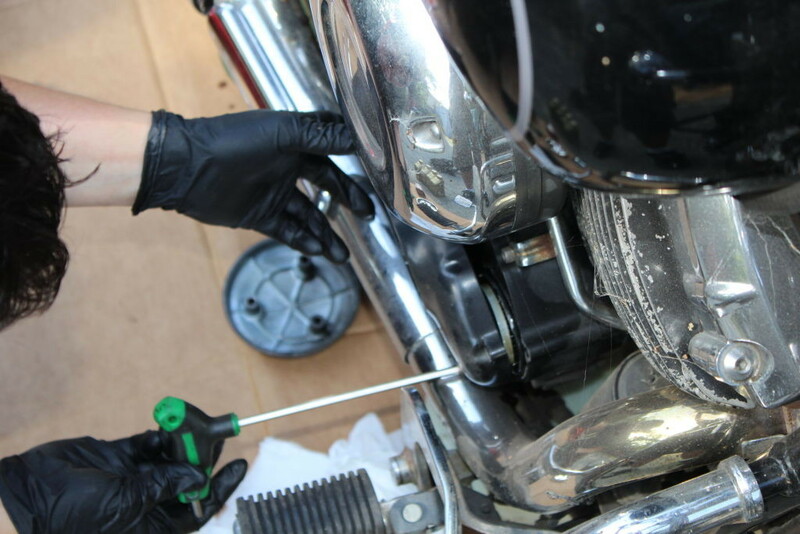 If you use a torque wrench, the manual calls for 43 Nm (31 ft-lb) of torque on the drain bolt. I opened the oil-filler cap and placed a long-necked funnel in the opening. 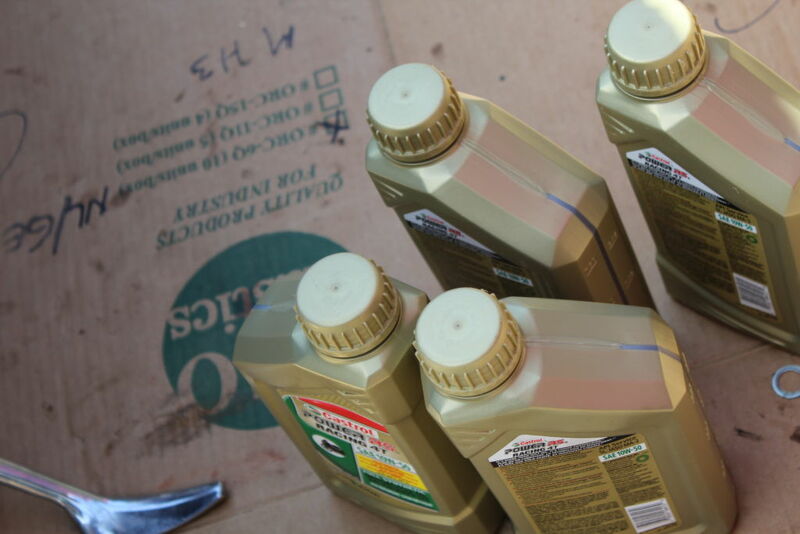 The oil capacity of the V-Star 650 is 2.97 quarts; the bike owner had 4 quarts on hand just in case–a wise move. I poured in 2 quarts of oil, then figured I should check the oil sight glass to monitor the rising oil level. 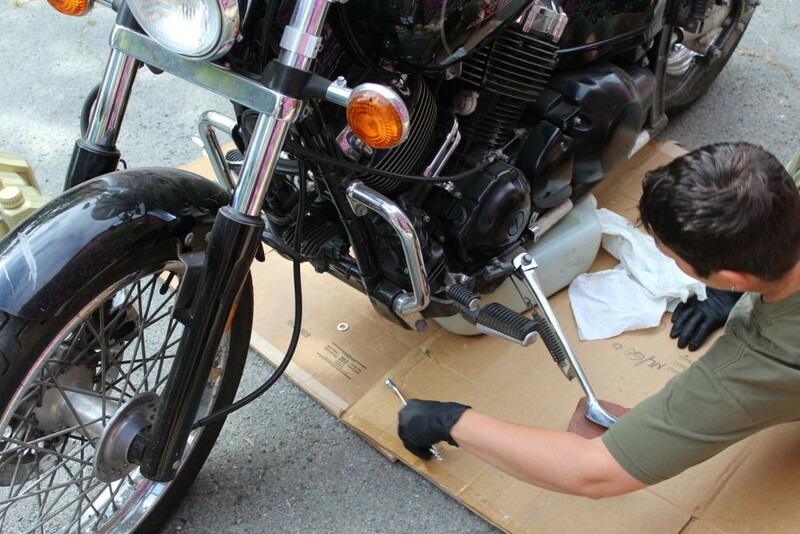 The sight glass is low on the left side of the bike; it’s easier to have an assistant hold the bike upright while you sit or crouch and look at the sight glass. It’s in the middle of the photo below. I poured oil and checked the sight glass repeatedly, with my helper holding the bike upright, until the sight glass was completely full. I let the oil settle for a couple of minutes, then started up the bike and let it run for 3 minutes to circulate the new oil through the engine and filter. The level dropped somewhat, once I’d allowed the bike to cool for another 3-5 minutes, so I topped off the level and started the bike for another 3 minutes, then waited for another 3-minute cooldown. 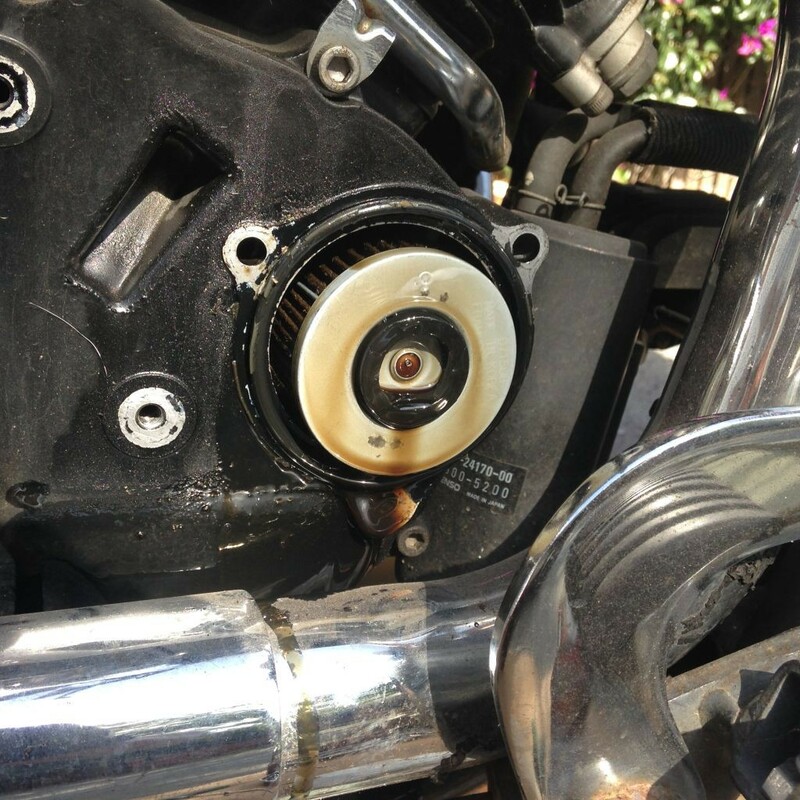 After a couple of running and cooling down cycles, the oil level was perfect–almost to the top of the sight glass. The V-Star 650, ready to ride. Glad that cardboard was there! Glad that cardboard was there to prevent an oily mess in my driveway! The bike had a fresh oil and filter, and I put my tools away, cleaned up, and sealed the used oil in jugs and the used filter in my drainer for later recycling. I’m lucky enough to have an auto parts store that recycles oil a mile from my home, and that’s where I took the oil and filter for recycling. 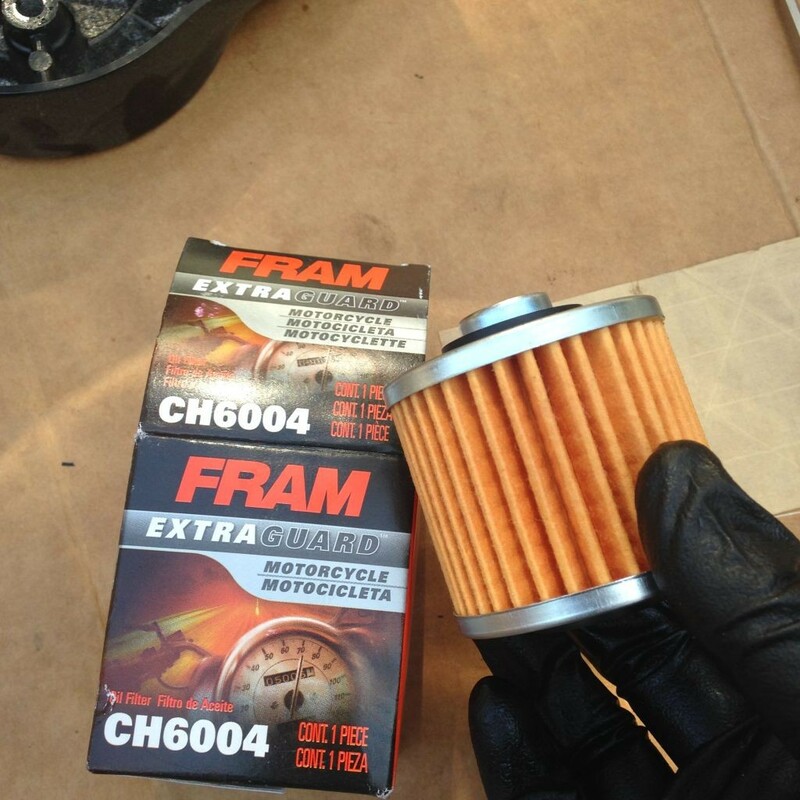 If you’re in San Mateo County, check out our blog post about how to easily recycle your used oil and filters. To find your own convenient oil and filter recycling location, click HERE and enter your zip code. Note: Several of these photos were taken by the bike owner, Sue Bennett. Thanks Sue, two hands are better than one! I thought this was an excellent tutorial. It gave me the nudge I needed to do an oil change on my own. I am left with one question. I noticed an o-ring embedded in the inner housing plate that covers the oil filter. You made no reference to it. Should it be changed with every filter change? 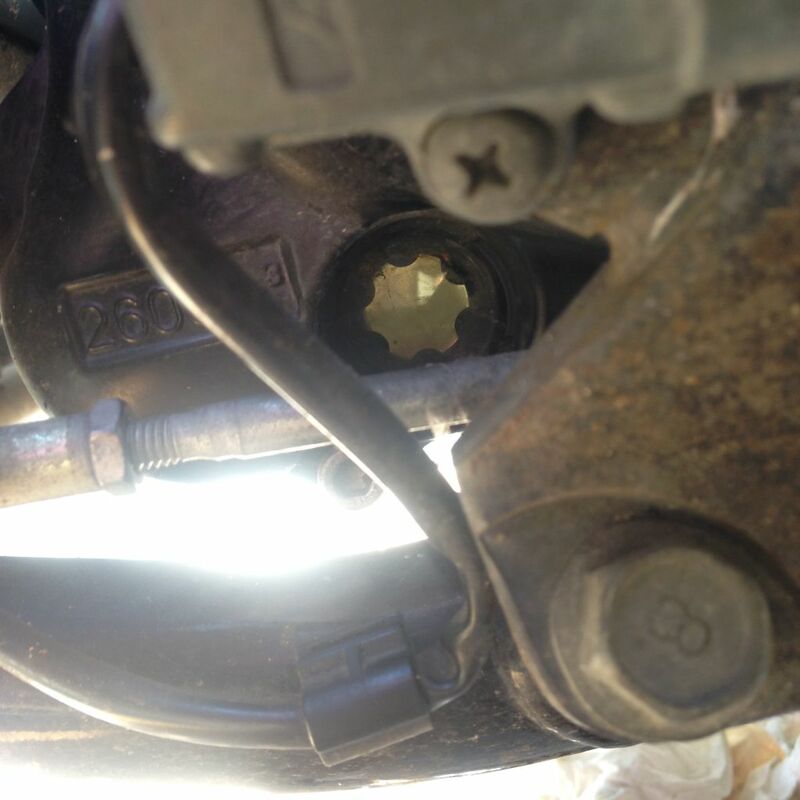 How did you manage to reach the oil drain plug using a socket and extension? I tried to use a swivel and still couldn’t do it. Frame is in the way. I needed to use a box wrench instead. 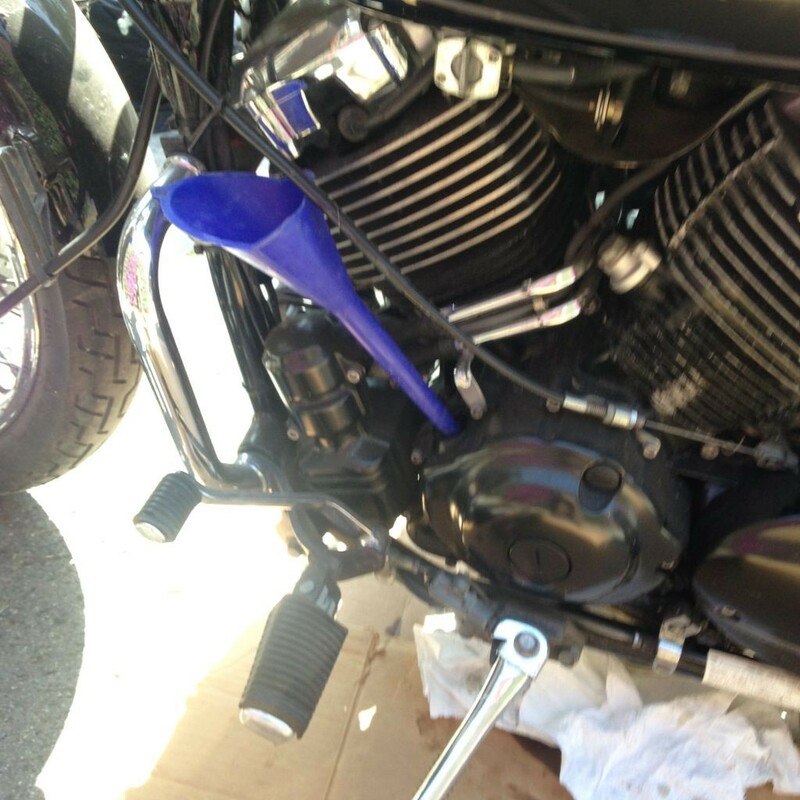 Hi I did an oil and filter change on my 09″xvs 650 custom no oil leaks but when I took it out for a ride I found it hard to get back to neutral any answers John..
Just what I was looking for, excellent information. Now only if I can find one on a 2011- 850 Triumph Speedmaster. Just what I was looking for, excellent. Now only if I can find one one a 2011 850 Triumph. 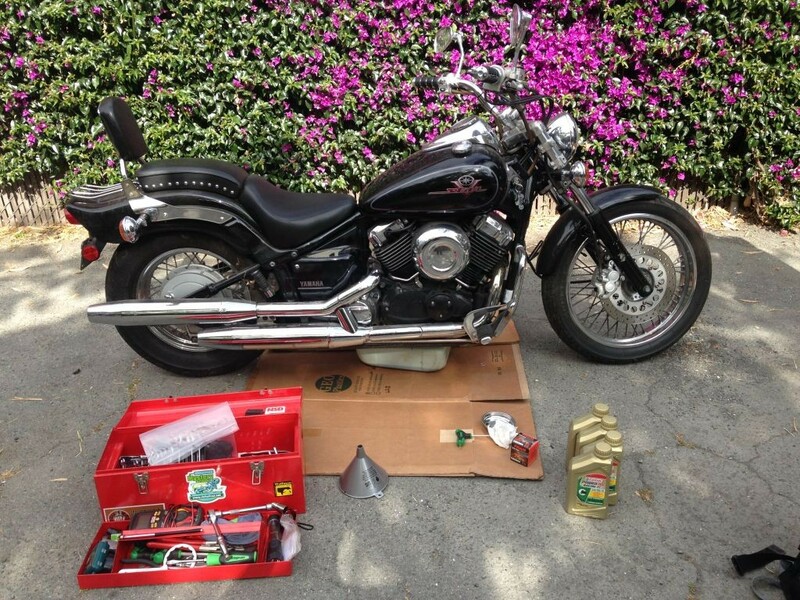 I just had a oil change done on my 2014 yamaha vstar 650 they only put in 2 quarts of oil does in it call for 3 quarts for that bike. Great link – photos were a huge help. My first oil change ever! Thank you for such an excellent post!!! This is exactly what I needed to get me going!! This is a wonderful demo for new bike rider like me, I will definitely follow your advice for changing bike oil. Thanks for this information. VERY GOOD JOB!!!! Thank you for taking the time to do this. You should do this professionally. One of the best help sites I’ve found. Was going to have shop change my oil but now I know I can do it myself. Thanks. Great information, instruction and pics. I have been searching the net to find some info on my newly purchased vstar 650 custom, couldn’t find anything helpful until I happened upon this site. Fantastic, very informative, easy to understand. You bet I will be recommending it to all my friends. I can’t thank you enough..Respctfully, B. Hinkle…. when I checked my oil level from the top screw off cap I did not see any oil, stuck my finger in no oil. Next I proped the bike upright and saw no oil in the sight glass. 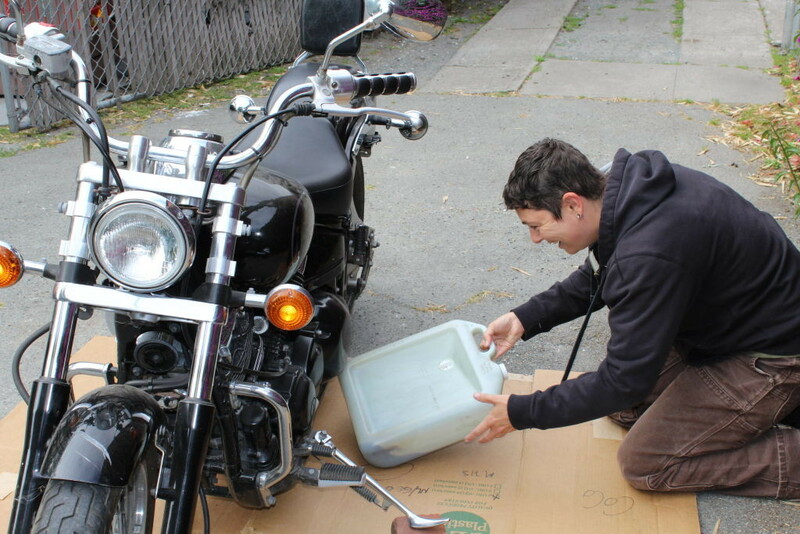 So I poured in 2.5 quarts of 20-50 for motorcycles in along with a small bottle of oil stabilizer. 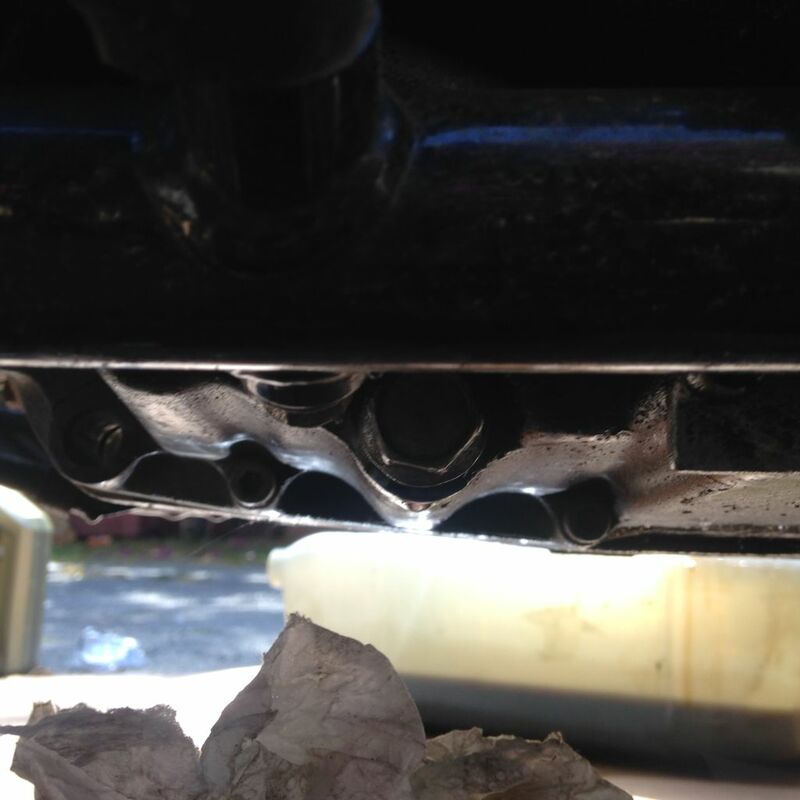 Heres my question when looking into the oil pan, should the oil be over the metel parts or near the top? My sight glass shows full. On mine (2009) there is a min/max marker dividing the window into thirds. Thanks for the article. I just bought a used V-Star 650 a couple weeks ago. Oil looks good through the site glass but I will change the oil after I ride 600 miles or so. This is exactly what I needed to get me going!! how do you check the oil if the oil window is broken? I was only looking for the oil viscosity but your presentation here was very organized and well delivered. Great link – photos were a huge help. Thank you! My first oilchange ever! Thank you for such an excellent post!!! Glad it was helpful–may you have many happy wrenching days.